Behind the scenes I’ve been working on a Stand Up Paddle (SUP) fin project for quite a while now, 3D printing many prototypes, and more often than not, failing! There is more to this project than meets the eye, but for now the details are under wraps. However I thought it might be interesting to share some of the 3D prints in case anyone feels inspired to give it a go themselves. 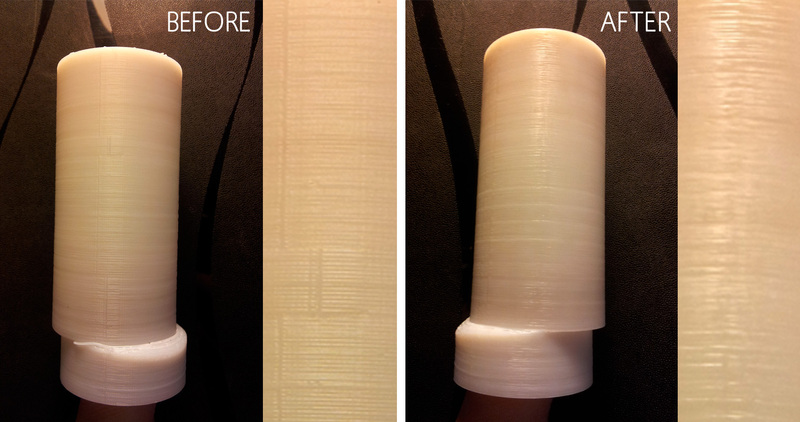 These images show some of the breakages I’ve had due to layer delamination – unfortunately the optimal way to print the 4 pieces in terms of minimising support material and warping is vertical, however the optimal orientation for strength is laying down on the flat sides (similar to the image on the right). A bit of an oversight on my part I’ll admit, however I was genuinely surprised how much force the flat water put on the fin. Another issue may be the minimal infill, which was also beefed up in my later prints to add internal strength. There is always a delicate balance between print orientation, layer strength and infill in 3D printing, to name just a few! It seems like a good time to look back at some of the designs I’ve shared on Thingiverse, mostly over the last Xmas break when I actually had the spare time to make these sorts of things! It’s really cool to see people making things that you’ve created for yourself and getting some enjoyment from them! The image on the left is not actually my design at all – it’s a kiteboard hydrofoil (basically a fancy attachment for a kitesurfing board that allows you to ‘hover’ above the water). @danleow did however take my standard kitesurfing fin (you can read all about my design and testing here or even download yourself a copy for free) and modify it to help in the creation of his hydrofoil (the blue 3D printed part). Very cool! 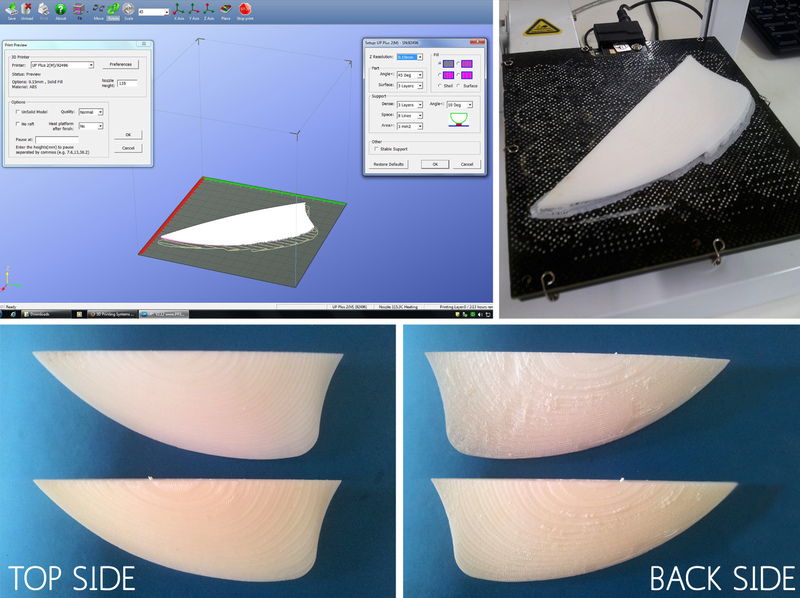 I’m actually hoping to revisit this idea soon, after meeting Greg Mark from MarkForged at the RAPID 3D printing conference, and seeing his examples of surf fins 3D printed with carbon fiber, I am hoping it won’t be too long before my university buys on of their printers. I just know this will significantly strengthen the design and stop the fins breaking. Next image is from @pcarlson of the replacement whisk for an Expressi Milk Frother – it’s such a small part that can be easily lost when cleaning, which is exactly what happened to me and inspired me to create the 3D file. Now I have an endless supply of replacements! Get yours and read my post about the design by clicking here. Lastly is the most complex 3D print I’ve shared on Thingiverse simply for the quantity of parts and requirement to fit with timber. Not for the feint of heart! The idea was to create a Mario Kart trophy for a bit of fun with my family for Xmas. The one pictured is from @Johns_Monkey, and includes just the basic components for the trophy – if you look at my complete design, there are 7 extra pieces that can go around the outside and act as platforms to hold your Mario Kart characters. I have a few other designs on Thingiverse for things like a Beer Bottle Lock and Phone Amplifier, if you happen to make any of these please add your photos onto Thingiverse 🙂 Happy 3D printing. The title and image says it all. I’m amazed the fins have lasted this well being the very first test (approximately 15 hours of use). I don’t actually know how this happened (possibly 1 of my massive stacks! ), it wasn’t until I was packing up my gear that I noticed. But as expected the screw holes were the weak point, with the stresses mentioned in a previous post always a concern. I may look at thickening the profile slightly and taking a small amount of material out of the holes as there was plenty for the screws to bite into. But for now I have a spare printed and ready to go. No time to rest with perfect weather at the moment! With perfect wind conditions lately there has been plenty of kitesurfing – I love summer! But with that my 3D printed fins (check out the full story here) have had a good workout, probably close to 10 hours in the water. As you can see in the photo the fins are still in top condition, just some grains of sand that have become embedded in the plastic. I have to admit even I’m surprised they haven’t snapped or simply de-laminated when slapping into the water off some huge jumps or being dragged through the sand in shallow conditions. It’s still probably too soon to call but I’m feeling like this is a success. Remember if you want a lifetime supply for your own kitesurfing adventures, I’ve uploaded the file to Thingiverse for FREE! Just follow the link here. All I can say is WOOHOO!!!! The fins work perfectly, just like a new set – I have to admit even I’m surprised! Since they work so well I’m giving them away for FREE so anyone can print a set and let me know how they go. Just follow this link to my Thingiverse page. Great little 1 week project, if you do print these fins out please let me know how they go. Final update before I test this thing out – The fins screwed onto the board nicely. These were just holes (unlike the real fins which come pre-threaded) as the ‘Up! Plus 2‘ wouldn’t create the detail of a fine screw thread. The only thing I’ve noticed is slight stress marks on the outside surfaces where the screws are, and very slight bulging. Perhaps the next version could be slightly thicker to increase strength around the screw, and maybe even try increasing the diameter of the holes by 0.2mm as there was plenty for the screws to bite into. Wind forecast: Avg 12.9KT, maximum predicted 17.2KT – Fingers crossed just enough to get out this afternoon, otherwise the next few days are looking pretty dead! 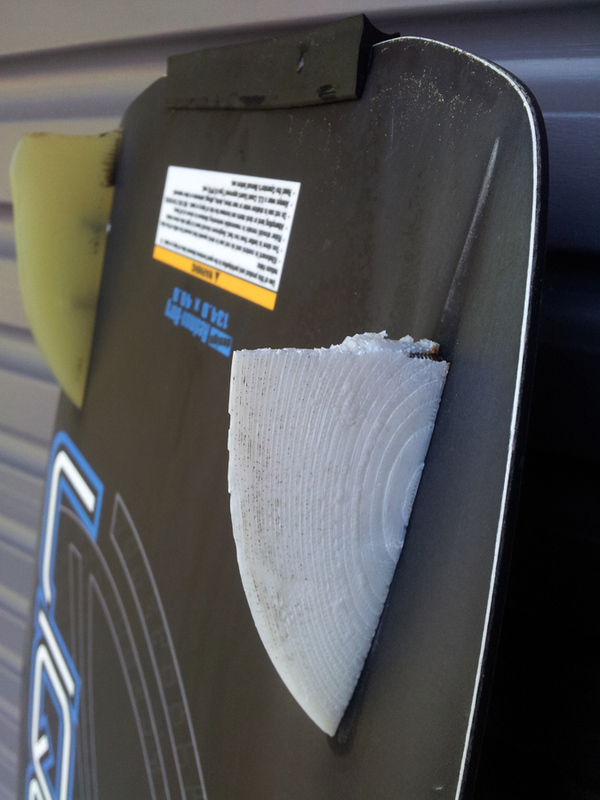 So far so good – I have printed 2 fins (to use on the heel side of the board where the most force is applied) on the ‘Up! Plus 2‘ printers. I oriented them laying down diagonally on the plate in order to fit the small size (140 x 140 x 135mm), and also for strength of the final product (layer orientation). I’m really impressed with the top surfaces, and only a small amount of cleanup required on the bottom – a bit of acetone or sandpaper should clean this up nicely. All that’s left to do is make sure the screws sufficiently grab into the holes, and then bring on the wind! Firstly, capturing these fine details on my phone camera is a real challenge! What I’ve done is brush acetone directly onto 1 side of an old 3D print to see how well it cleans up the layers. Having done some reading (Makezine, Airwolf3D, Solidoodle) I was expecting the surface to melt very quickly, maybe even go a bit soft and squishy – Nope! I’ve brushed on about 15 coats of acetone onto the model (leaving a few minutes drying time between coats) and at no time did the model do anything exciting. However there is a clear result, with the layers clearly blurring together and remaining glossy. It’s certainly not perfectly smooth, but running my fingernail along the surface there is a noticeable difference to the back-side which remains original. A few thoughts from this: 1. the ABS plastic we use at uni is premium quality, so no crappy other materials mixed in to potentially cause issues. 2. By just brushing on acetone it appears to evaporate very quickly and limits any effects, which in some ways is a good thing to control how far you want to go. 3. The 3D print itself has a thick 3mm wall, so there isn’t a high risk of the acetone seeping through to the inside and causing the entire wall section to soften. 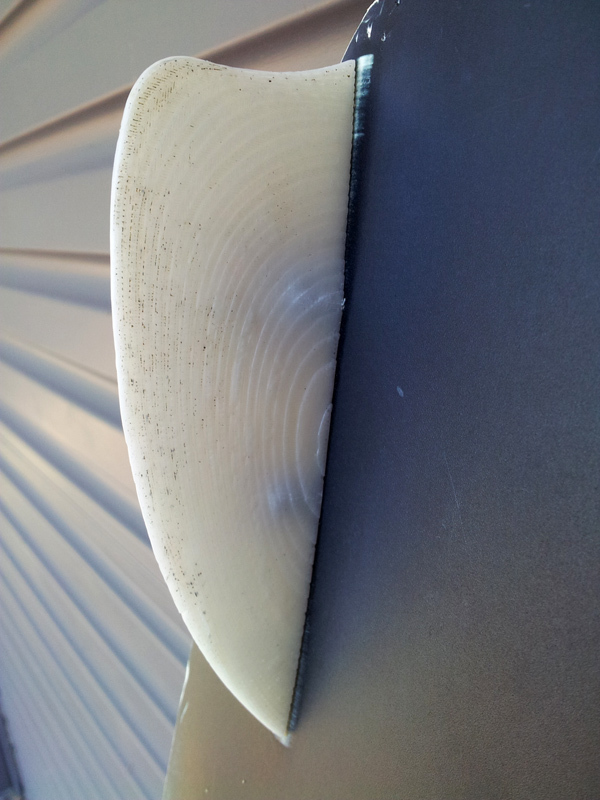 In terms of the kiteboard fins, this seems like a worthwhile outcome to smooth them off and potentially strengthen the outside surface. Cool. If you have your own experiences smoothing out 3D prints using acetone, I’d love to hear them, this is new for me. Please leave a comment or link. As the first post on this blog I thought I’d just jump straight in with what I’m working on right now. Being a kitesurfer I’ve been dying to find the time to try 3D printing some new parts to test out on the water. It begins today! I thought I’d start with the fins since they’re a nice manageable size for the small desktop printers at uni (starting with the ‘Up! Plus 2’). The first tests will be similar to the original fin to compare how it holds up in the water compared to the original (Liquid Force GTS 2.0). Some of this will certainly come down to the print orientation to minimise the chances of de-laminating while skimming across the shallows and scraping the sand. I’m also thinking about using an acetone finish to help bind and smooth the outside surface when I get this printed in a few days. Some of my students have started trialling this with success, so worth considering. If it works, the next step will be to experiment with the fin geometry. I’m definitely expecting some spectacular crashes on the water through this process, but that’s half the fun!